I came across the WMI namespaces ROOT\SecurityCenter (XP) and ROOT\SecurityCenter2 (Vista+) while doing some research. These namespaces provide the product and state for AntiVirus, AntiSpyware (SecurityCenter2 only), and Firewall as recognized by Windows. The ROOT\SecurityCenter namespace may be invalid on Vista+, and the ROOT\SecurityCenter2 namespace is invalid on XP; WLS will report the error once at startup and disable the offending WMI entry. The information from ROOT\Security center has fields defined such as “displayName”, “enabled”, “productUptoDate”, and “onAccessScanningEnabled”; whereas ROOT\SecurityCenter2 gives us “displayName” and “productState”. The productState is returned as a decimal representation of a hex value which contains the information we need, just encoded. A bit more research turned up some helpful posts, notably http://neophob.com/2010/03/wmi-query-windows-securitycenter2/, which lead to the creation of a `decodeProductState` macro. The macro converts the productState to hex, trims the leading “0x”, and adds a leading 0 to pad the result to 6 digits. Each pair of digits represents a state, so I split them that way for ease of reuse. Then specific values are checked for enabled and productUptoDate and assigned to enabled2 and productUptoDate2. Since there will be mixed results from ROOT\SecurityCenter and ROOT\SecurityCenter2, coalesce will be used to keep the first non-null value of enabled or enabled2, and productUptoDate or productUptoDate2, assigning the result back to enabled and productUptoDate. 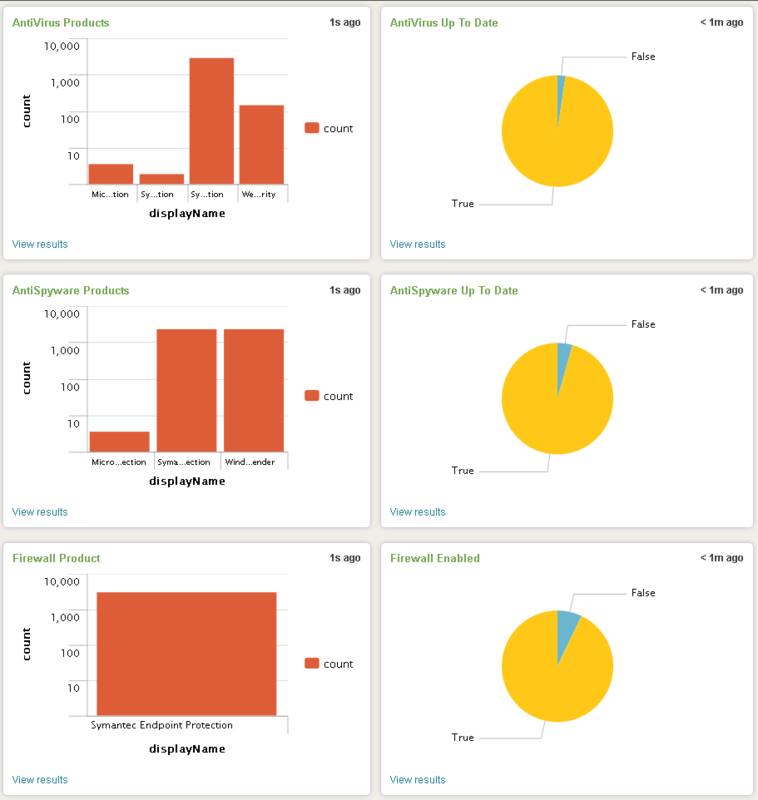 Finally I created a simple dashboard to display the results. This will get more refined as it’s utilized, but it’s a good starting point. This data can also be used to drive alerts if more than a certain percent or count of your hosts has outdated definitions, or to check for hosts that don’t have any products installed at all. Have other ideas for using the data WLS provides? Let me know in the comments below or via the contact form. This entry was posted in Splunk, WLS and tagged AntiSpyware, AntiVirus, Firewall, Splunk, WLS, wmi on September 4, 2013 by digirati82.